Mentalists, here's the last word in question reading, using no chemicals, no stooges and no apparatus. Any number of spectators write questions or other data on plain white cards, all of which are sealed by their writers themselves in opaque envelopes. Each spectator is designated by a number and these numbers are written on the envelopes. The performer gathers the questions, which are at no time out of sight of the audience, and begins to divulge the contents!. As soon as each question is answered, it is returned to the writer who acknowledges the card as the one on which he wrote and verifies the number on the envelope as the one previously given to him. 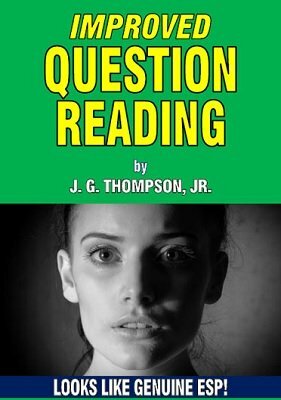 Every mentalist, magician and psychic entertainer is looking for the perfect method to be employed in a question reading act. This is as close as you can get to perfection in a Q&A act. Use ordinary blank cards and envelopes. Also includes a "quickie" version where just three cards and envelopes are passed to spectators. One is to write a number, another a name and one a drawing. The climax comes when you reveal the information on the first two cards, then go on to duplicate the spectator's drawing. PLUS a version where your assistant duplicates the spectator's drawing. 1957 edition, PDF 16 pages.